Dubai’s Roads and Transport Authority (RTA) has conducted initial tests of autonomous transport pods under a partnership with US technology firm Next Future Transportation. The agreement, first announced early this week, comes under the Dubai Future Accelerators programme to address challenges faced by key government organisations. Onboard 3D and ordinary cameras help each pod avoid accidents. “The prototypes of these units are manufactured in Italy and shipped to Dubai for trials. 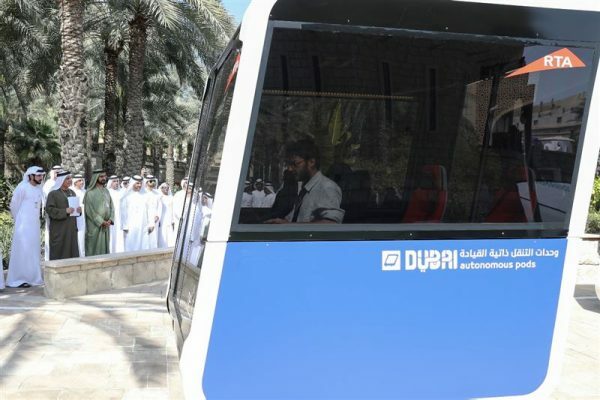 These pods run on a virtual pre-configured and programmed lane and are overseen by the operational system,” said RTA director general and chairman Mattar Al Tayer. The pilot test was overseen by UAE Vice President and Prime Minister and Dubai Ruler HH Sheikh Mohammed bin Rashid Al Maktoum. Sheikh Mohammed has directed that 25 per cent of journeys in the emirate are autonomous or driverless by 2030. On Tuesday, the RTA also launched a challenge for self-driving vehicles with $5m of prizes for entrants from international companies, start-ups and universities.